The Attorney General had said that this constitutional provision voids Persaud’s vote, which he cast on December 21, last. Persaud, who voted in favour of the motion of no-confidence against A Partnership for National Unity + Alliance for Change (APNU/AFC) government, is a citizen of both Guyana and Canada. Challenging the validity of Persaud’s vote in Parliament would also bring into question, the validity of judgments made by many other members of the National Assembly on both sides of the political divide, who also have dual citizenship. The government will only be challenging Charrandass Persaud’s vote, despite the precedent it will set. If the speaker of the house interprets the constitution to state that Persaud’s vote is null and void, the implication would be that the no-confidence motion would have to be reversed, allowing the government to carry its time in power to term, until General Elections in 2020. Jagdeo said that what must be considered is “…what it will do to all the legislation passed before. The Leader of the Opposition also said he was advised that there is a principle in law which states that these issues can’t be dealt with, retroactively. 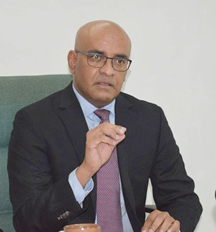 Because of the government’s protests of the no-confidence vote, Jagdeo said that the opposition will not be attending parliament when it reconvenes on January 3, 2019. The opposition, he stated, will be writing to the Speaker of the House, to notify him of the intended absence of the opposition. He further told the press that the opposition would only attend parliament if the proceedings relate to the progression of the country toward General Elections, as the constitution would dictate in the case of a carried no-confidence motion.